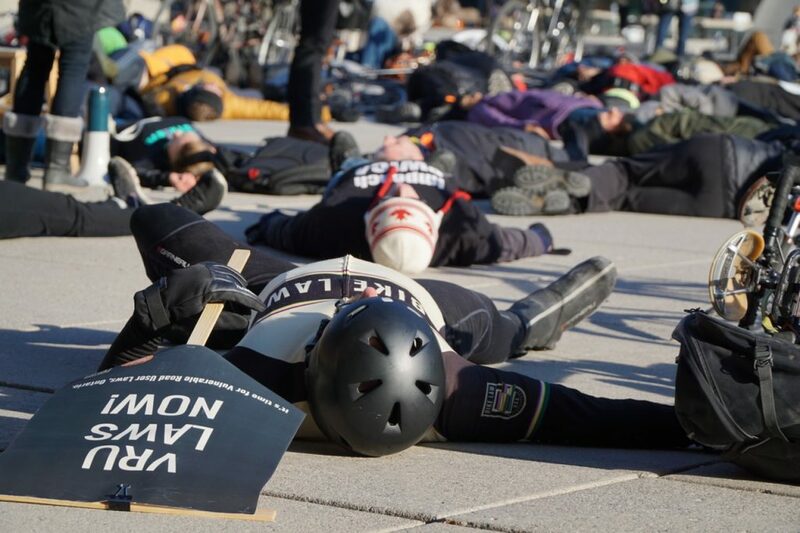 Tonight, March 22, 2018, advocates for safe streets held a die-in at City Hall. 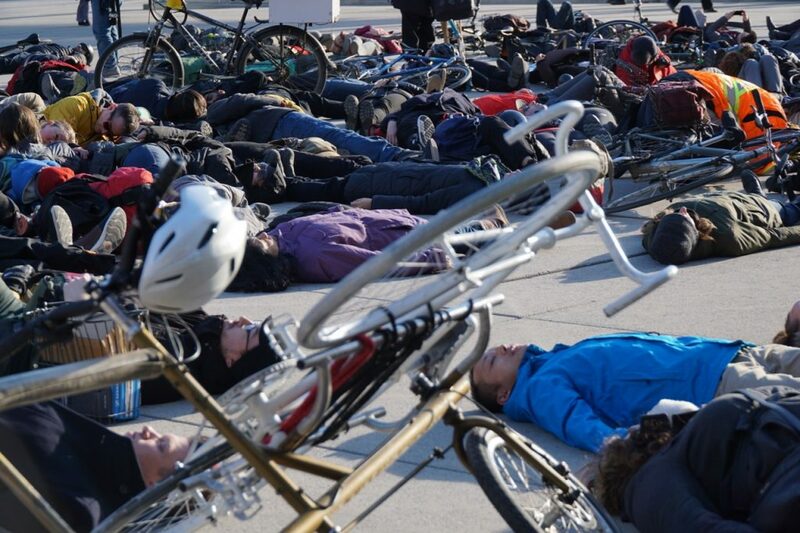 About 200 people turned up to lie down. 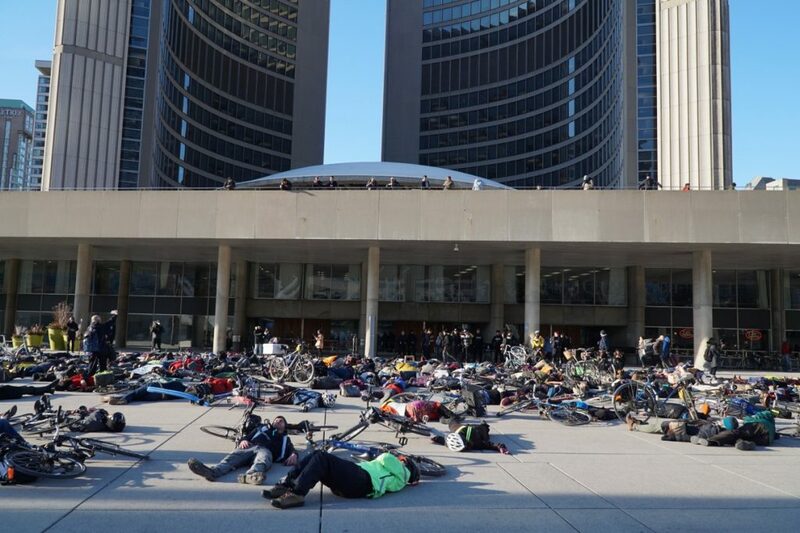 Organized by Friends and Families for Safe Streets (FFSS), the event was held to draw attention to the fact that 12 people have been killed by traffic so far this year. 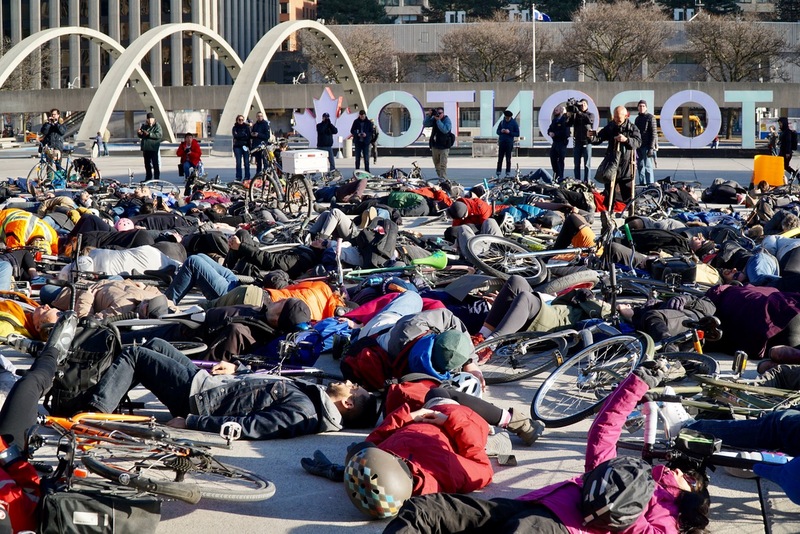 The die-in was also timed to coincide with the meeting of City Council during which council considered proposals for pedestrian and bike infrastructure on Yonge St. between Finch and Sheppard. The plan supported by the local councillor and recommended by staff involved narrowing the street from six lanes of car traffic to four, widening sidewalks, and adding bike lanes. 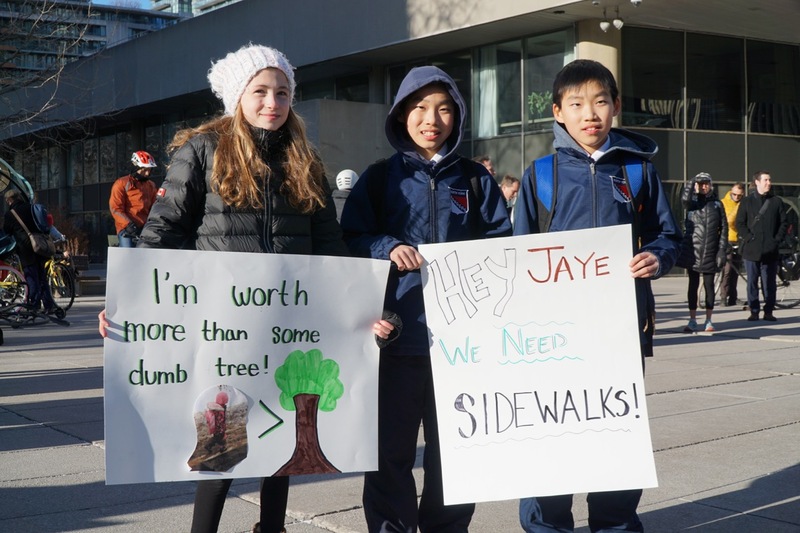 This proposal was spiked at the public works and infrastructure committee (PWIC), and an alternative was put forward, preserving six lanes of traffic, and consigning the bike lanes to a side street. Unfortunately, the mayor has put his support behind this alternative because of his concern about traffic congestion. This begs the question about priorities in the city. Must we always prioritize the throughput of cars over the preferences and the quality of the public realm in any given neighbourhood? Jess Spieker of FFSS calls everyone over to gather in front of City Hall. 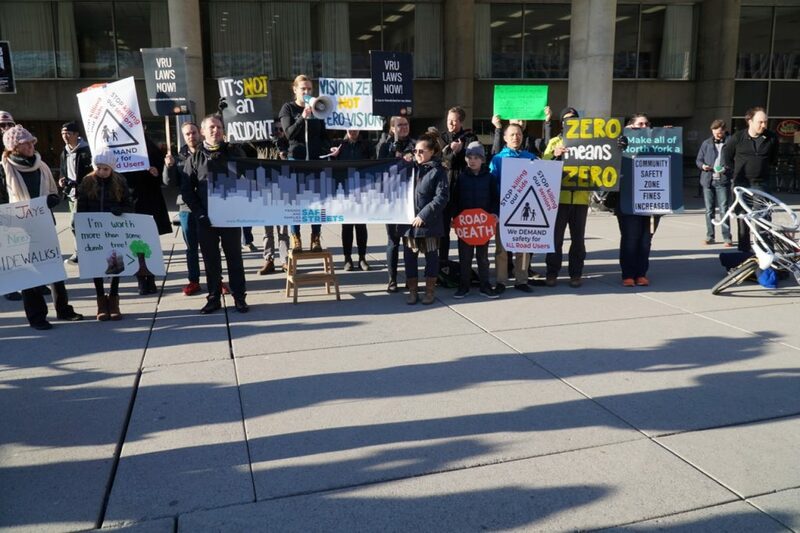 She is flanked by representatives from all the groups that have banded together for tonight's event, including Walk Toronto, Advocacy for Respect for Cyclists, Doctors for Safe Cycling, and Bike Law. People were then directed to lie down. It is estimated that over 200 people participated in the event. 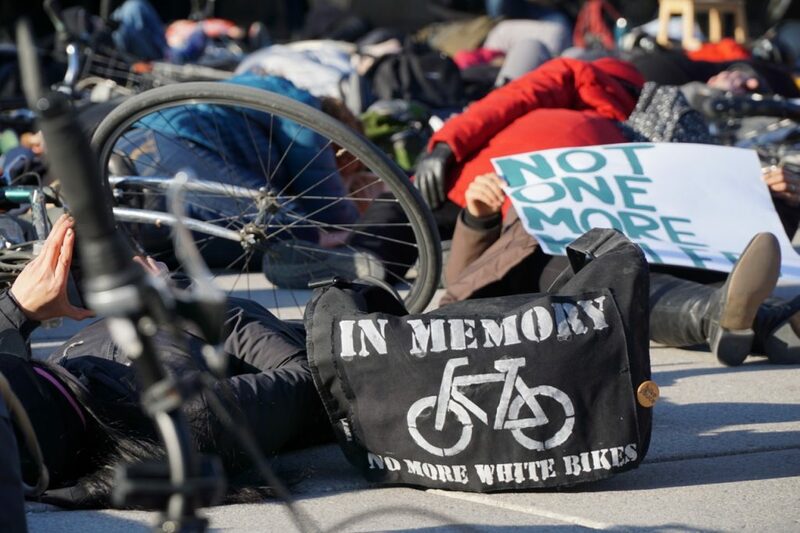 Afterwards, a group of cyclists gathered to set out on a ghost bike ride to Don Mills, to remember a cyclist that died in Don Mills last Tuesday. More pictures from the ghost bike ride can be viewed here. Thanks to the organizers of the event. Let's see if City Council holds to their stated principle of Vision Zero, rather than showing zero vision as per usual. 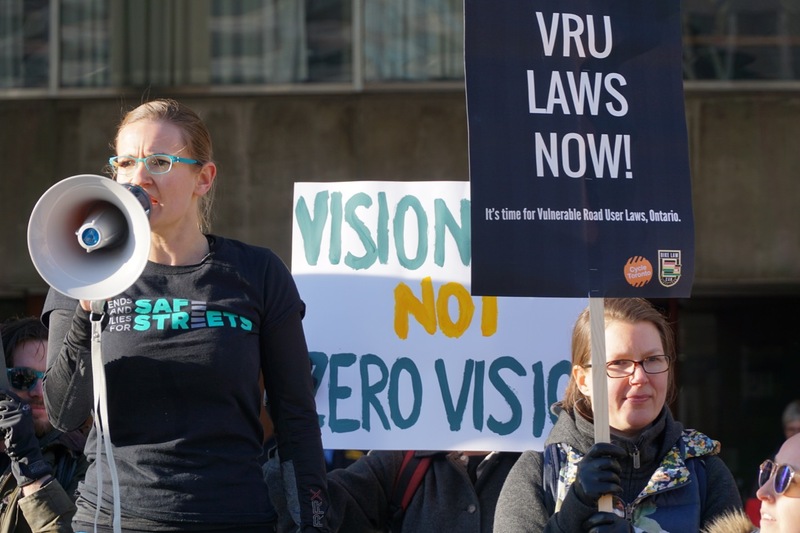 Vision Zero: A road safety plan for Toronto?